Opening and closing a trade is simple in Plus500. A trader with a Plus500 account can trade CFDs on Forex, Stocks, Commodities , Options and Indices. Below I will explain to you how to do this and what the options mean that you see during opening a position. 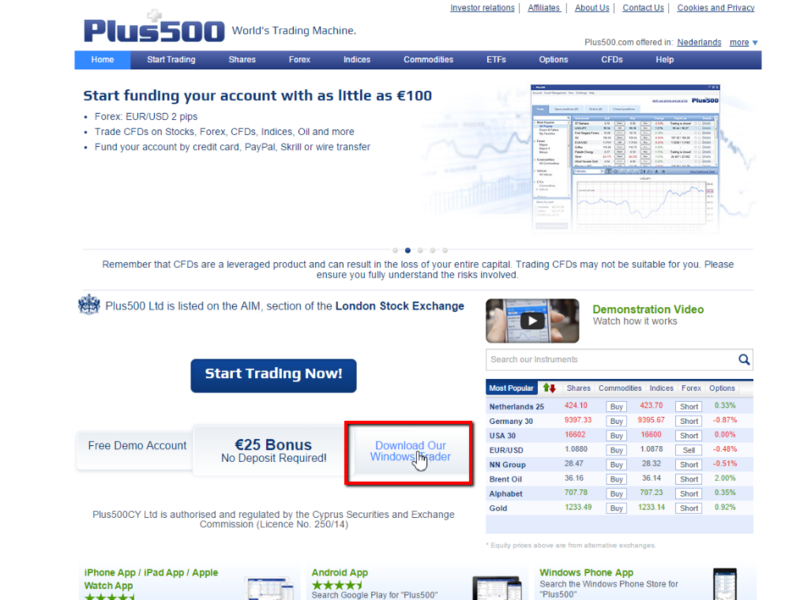 Login to your Plus500 account via the webtrader. Create an new account if you haven’t done it yet. Login and in the menu at the left side of the page, click on ‘Trade’. Here a list of all tradeable instruments can be seen. Now Plus500 is one of the few online CFD brokers who has that many instruments, so you can trade stocks, commodities, indices and forex from all across the world. Now for the sake of learning, let’s say you want to trade in the USA stocks of Apple (iPhone, iPads anyone?). 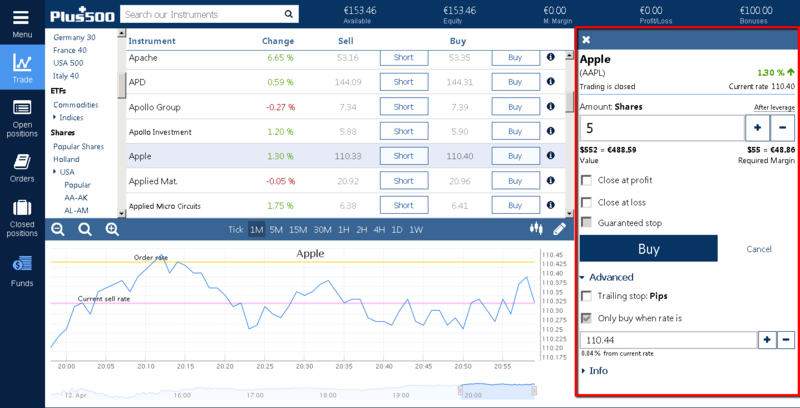 You now go to: Trade -> Shares -> USA -> AN-AW and find Apple in the list. You could also just search for ‘Apple’ in the search field at the top left corner, next to the Plus 500 logo. 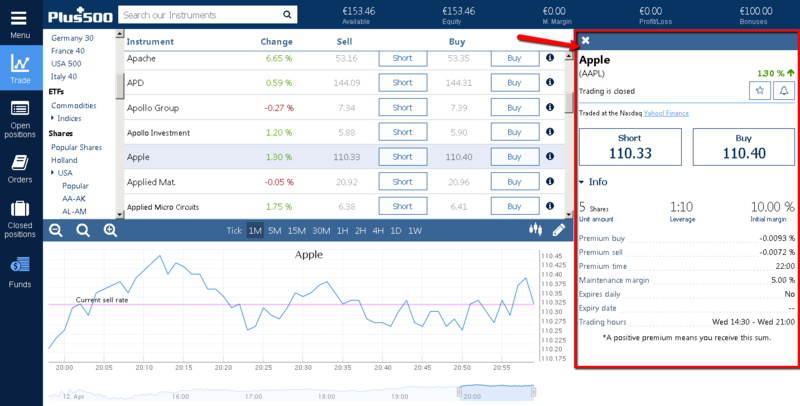 When you click on the Apple row, information about that specific stock is displayed on the right. In the next section I will explain to you what this all means. For now, important to know is what the difference between short and buy is. In the screenshot above you must have noticed two options: short and buy. For the people who know a bit more about trading, simply put this is the same as going bear and bull. Whereas short is the same as going bear and buy is the same as going bull. Going short means you anticipate that the stock will go down. Let’s say you short a stock at £20 and tomorrow the stock value becomes £15. You will have made a profit of £5. Buying a stock means you anticipate the exact opposite. You think the stock is going well, so the stock will increase. Let’s say you buy a stock at £20 and tomorrow the stock value becomes £25. Your profit is £5. Of course these are just examples, if you are using Plus500 you’ll also get leverage and your profit (or loss) will most likely be a lot more. 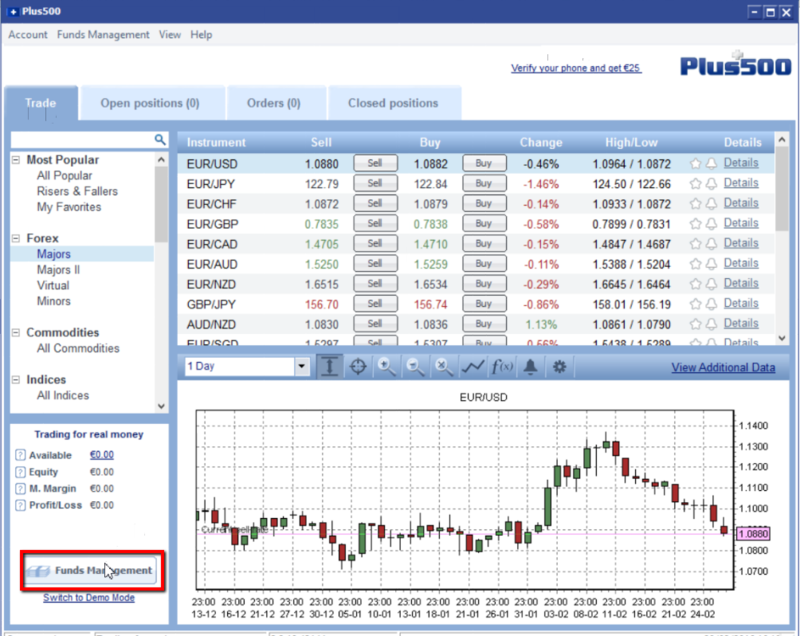 When you click on an instrument in Plus500 you will be displayed a screen with information about that instrument. Let’s take Apple for example again. Look at the screenshot below. I clicked on Apple and information about that stock is displayed on the right now. Plus500 gives a couple of important information here, which I will explain in detail below. The first thing you see is the title: Apple (AAPL) this is the stock you selected. Between the brackets the stock symbol is shown. This is the stock acronym that is used worldwide to identify that stock. Sometimes a stock name can be a lot a like, looking for that stock with the unique symbol makes it a lot easier to find that stock. Next you’ll see pricing information of this stock. The current high and low values are shown here. This is taken right out of the Yahoo! Finance page. You can also see how much the price has changed in percentage in comparison with the opening value of that day. When the stock market is closed, you’ll see the line ‘Trading is closed’. The line ‘Traded at the Nasdaq Yahoo! Finance’ just tells you where the stock belongs and where you can find it on Yahoo! Finance. Nasdaq the second-largest American stock exchange, usually consists of a lot of technical companies. Next there are two buttons available. Short and buy and below this the value of the stock that you will short or buy. You see a little difference here. This is called the spread, the spread is what you pay to the broker as a commission. This usually is not a lot, depending on the stock’s popularity and value. Be careful with this, because to profit you need to make more money than you pay in the spread. When opening a stock I suggest you to try it in demo mode, to see how much the spread is exactly. Leverage: this is not the same everywhere. Sometimes it is 1:10, but the maximum leverage is 1:30. Leverage is a way to make your money worth more than it is. Let’s say you want to use £100. A leverage of 1:10 means your £100 is worth £100 * 10 = £1000. This means with only £100, you can buy stocks that is worth a £1000. Yes, this means you can make 10 times more profit, but this also means you could lose 10 times faster. This last thing sounds scary, but Plus500 gives us a negative balance protection. This means you cannot lose more than your deposit. This means that if you deposited £100, you can profit from £1 to £99999 (infinite) and only lose a maximum of your deposit £100! In my opinion this is awesome. A more detailed explanation about CFD stocks and leverage can be found here. Premium: If you keep a position open overnight, a night premium is added or substracted from your position. This means you pay a small amount of money overnight (or you gain it). This is very low usually, so I don’t pay much attention to it. As you can see Apple’s overnight buy premium is -0.0093% of your position. Premium time: This is the time that the premium is done. I almost always keep my position open for a night and I have never really noticed premium much. Maintenance margin: This is important information, because if your position goes below this margin your position will be automatically closed. So to keep your positon open, your current account balance needs to exceed this margin. Thankfully, this isn’t much either. I usually deposit £100 and use that £100 completely in a position and this position can be kept overnight without it autoclosing on me. If you open a position, this margin will also be automatically calculated for you in the top header (look for M. Margin) – so you don’t even have to calculate this yourself. Expires daily/expiry date: I have never noticed this much. I don’t think this applies to stock, but might apply to something else. Just make sure to check if this is ‘No’. Trading hours: This is important to know. 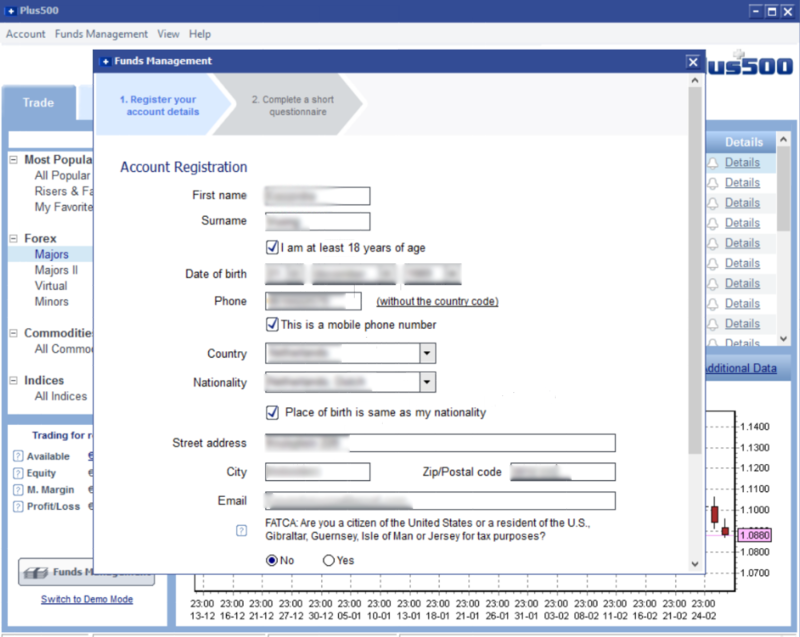 Plus500 automatically changes this time to your timezone. An American stock is usually open from 9.30 am to 4 pm American time, but the time shown here is in your own time. Which is great and makes it so much easier to time your trades well. Now you understand the information screen. The next screen to explain is the screen when you want to open a position. The short screen has the same information, so I will explain this only once. 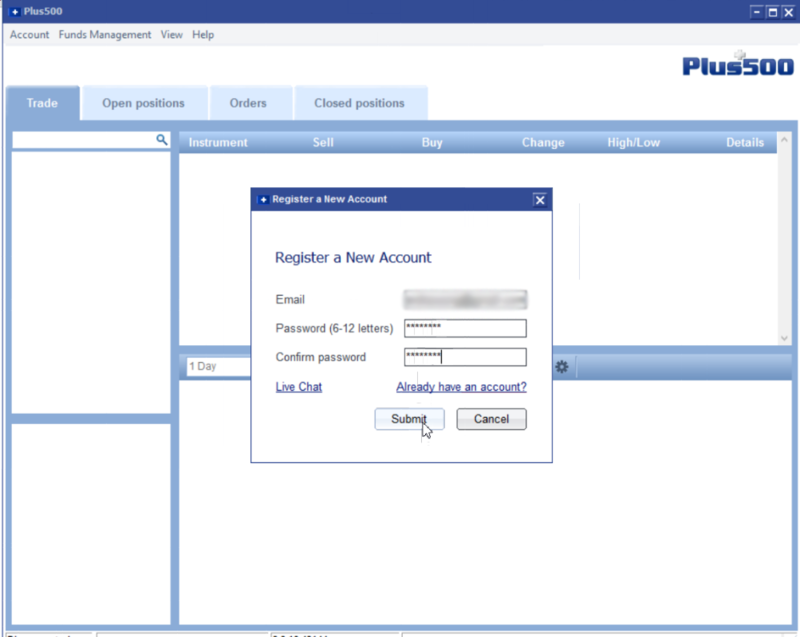 The Plus500 short and buy screen is very nicely done with the user in mind. It gives great information and makes it easy to open a trade. The first thing you see is the stock name and symbol. The current value and the percentage of movement since the opening time. Now to open a position you need to decide how many shares you want to buy. Let’s say here youw ant to buy 5 shares. The value of this 522 dollar, which is the same as 488,59 euro. 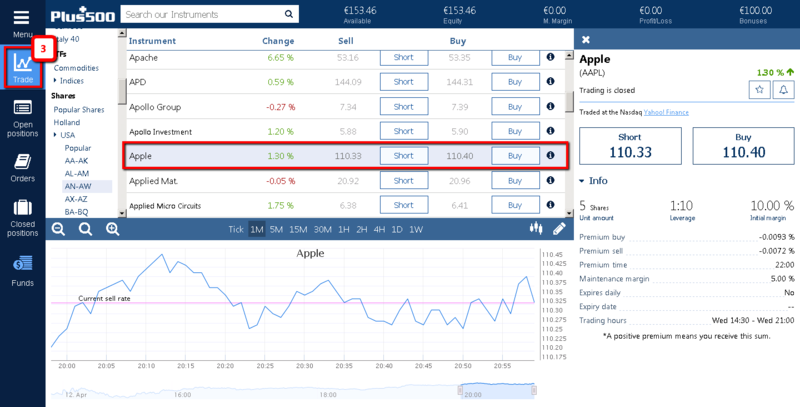 Plus500 automatically takes the foreign exchange price of your currency and the one the stock is using, which usually are dollars. This is great, you don’t really have to pay much attention to this. Also, because Plus500 is giving you leverage of 1:10 of this stock, you only need 55 dollar to buy 5 shares that is valued 522 dollar. Amazing right? So really you only need to pay attention to the ‘Required Margin’. This is the amount that will be substracted from your account to use in the position. So not the value, but the required margin. This is important. Next you have ‘Close at profit’ and ‘Close at loss’. 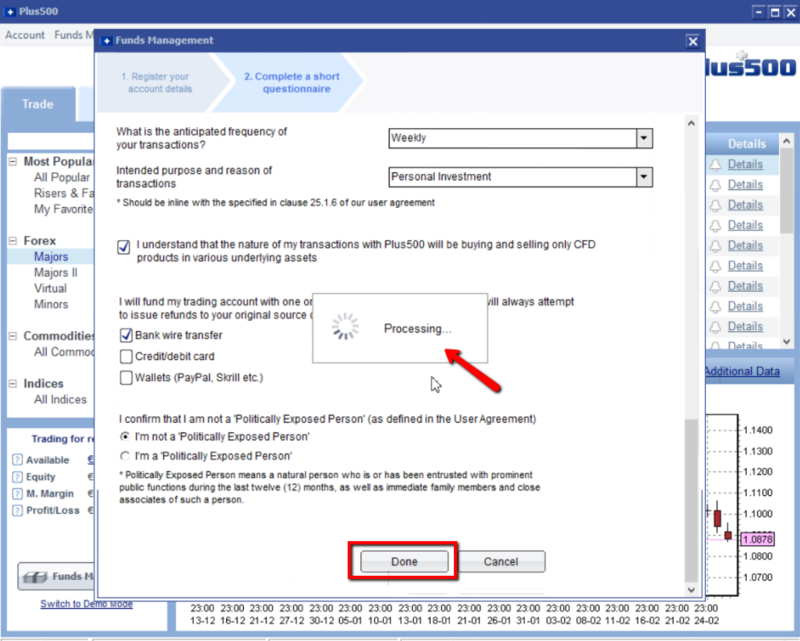 These options give you the ability to let Plus500 automatically close your position when the stock value reaches a certain value that you set. This is great if you don’t have the time to close it yourself and want to let it happen. Also, if you are losing this guarantees a certain loss. So instead of losing your whole position, you only lose what you want. Or the opposite: profit what you want. Guaranteed stop sets an absolute limit on your potential loss. The position will be closed at the value you specified, even if the market gaps suddenly, your position will be closed at the value you specified. The advanced section I will explain in a later article. Below this section, the information I explained earlier is displayed again for your convenience. When you are ready, just click on the big blue button ‘Buy’ and your position will be opened. This position will be shown in the left menu at ‘Open positions’. Or in the stock list, under the stock itself. Don’t forget, to truly learn how to trade, you need to try it yourself for a couple of times to be able to get the hang of it. Try it out with small amounts of real money first to feel how you react to profits or losses. This is important to know of yourself prior to trading. 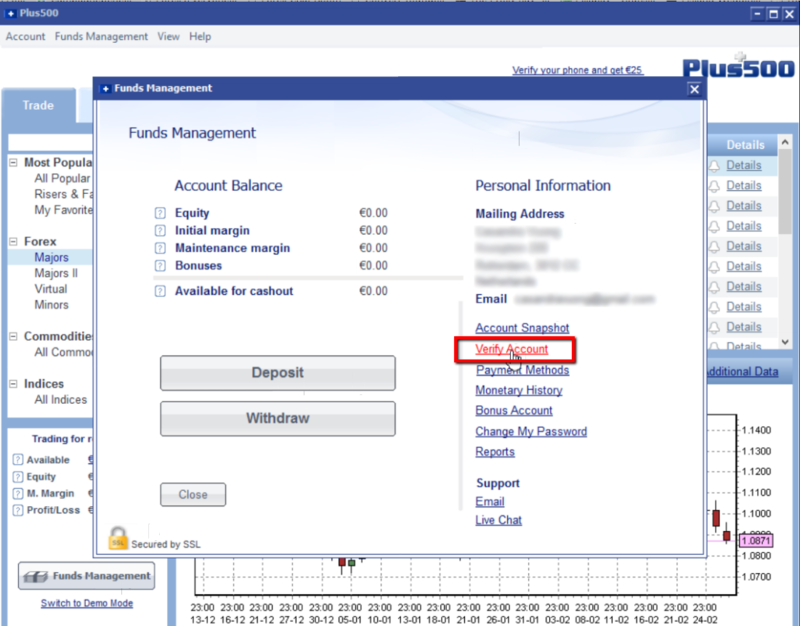 This section covers the following topics while using the Plus500 software. 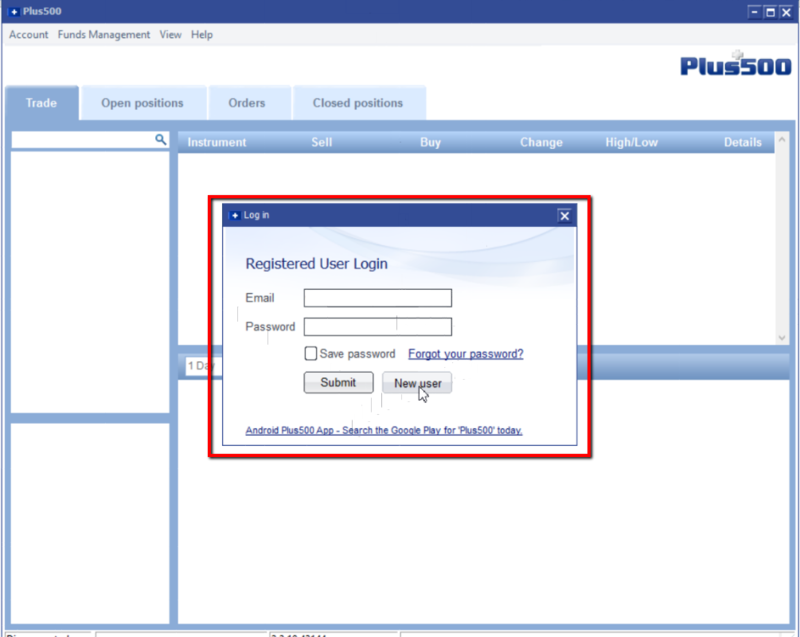 We will start with how to open and verify your Plus500 account using the software, scroll down to view the steps. If you’ve already done this, feel free to skip to the next topics. How to get free bonus money? 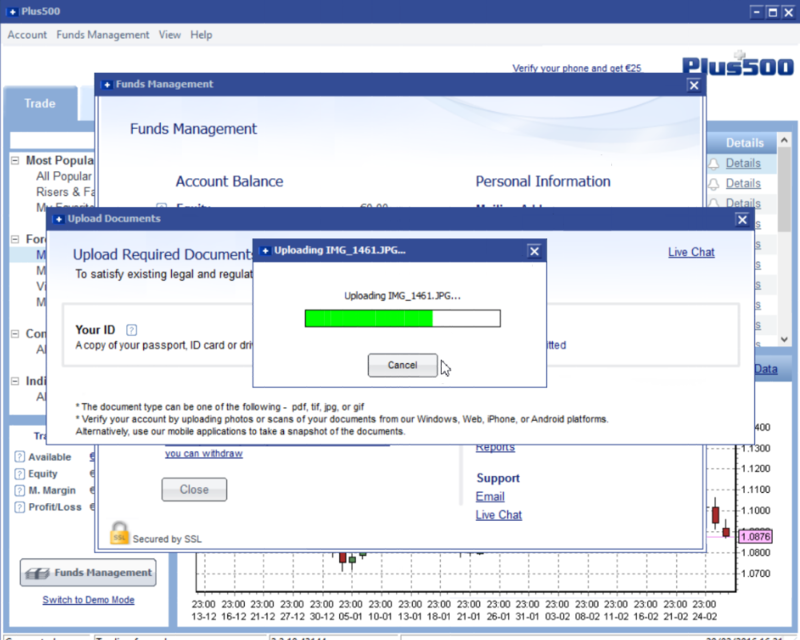 Downloading and installing the Plus500 software is easy. Just follow these steps. First, open the link: www.plus500.com. 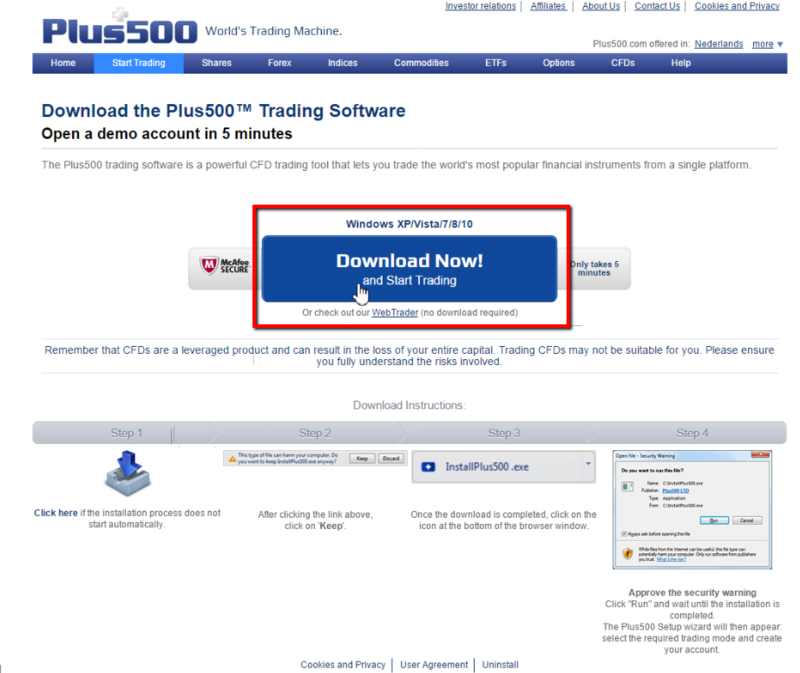 Then click on “Download our Windows trader”. Or download from a direct link (and you can skip to point 5). The next screen appears. Click on Download Now! Now your download will start and depending on what browser you use, you can start it immediately. Execute the downloaded file, Plus500 will now install on your computer immediately. Wait for this process to finish. 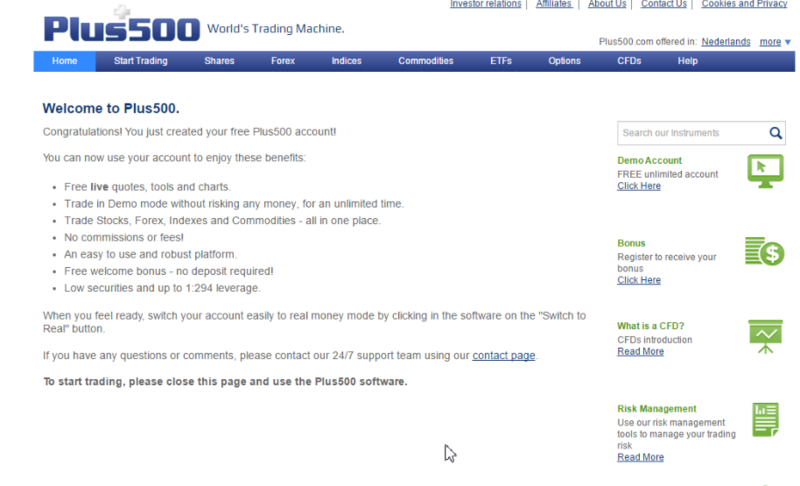 Plus500 will then automatically start up and you’ll see the following screen. Since you don’t have an account yet, click on New User. 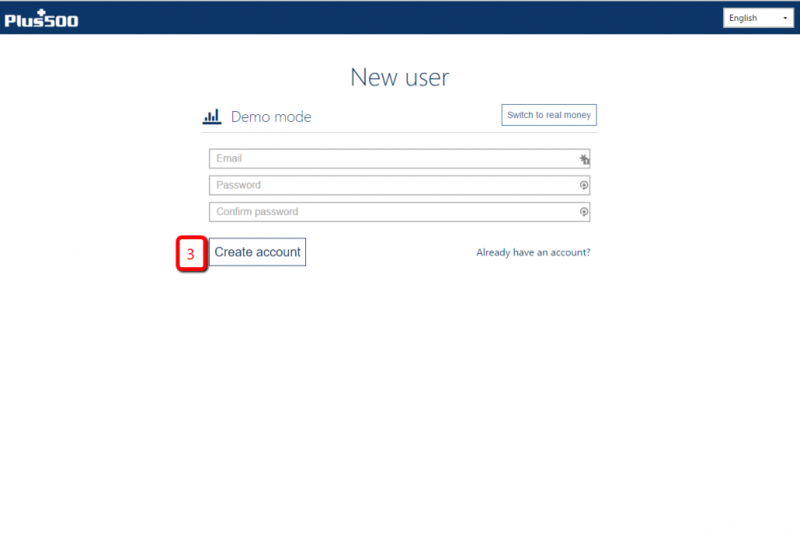 You will be automatically redirected to a welcome page of Plus500. 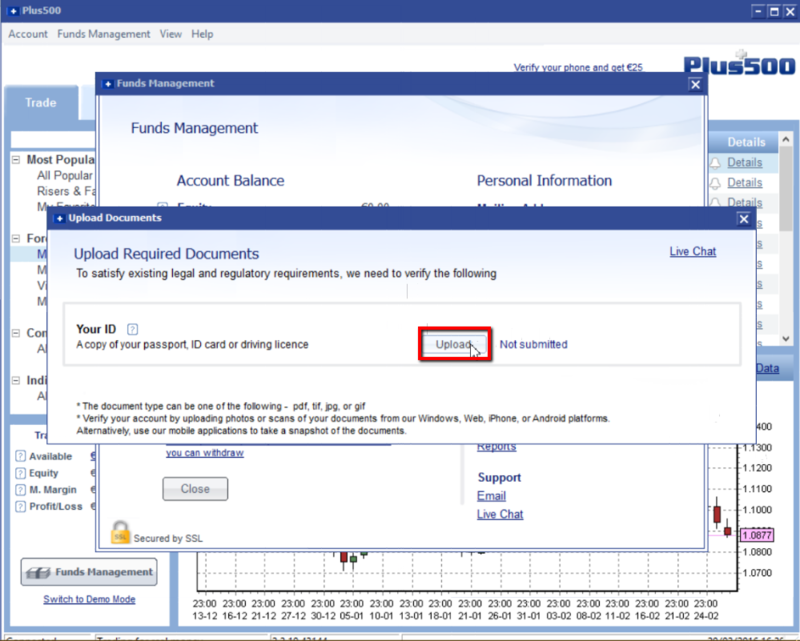 You can close this page and continue on the Plus500 software. 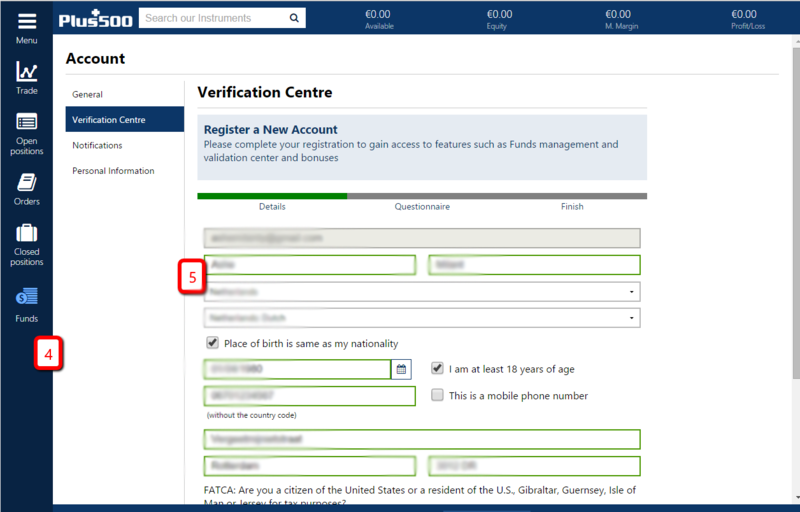 Here a few steps are required to create a fully approved account. Click on Funds Management for this. Plus500 will now ask you a few mandatory questions. Fill everything in, then click Done. Plus500 will start processing your information, wait for it to finish. You are now redirected to new screen, here you will have to upload your ID, which is a copy of your passport, ID card or driving licence. Click on Upload to find a copy of your ID. Tip: Take a photo of your ID with your mobile phone and email it to yourself. Once you’ve selected a copy of your ID, wait for the upload to finish. 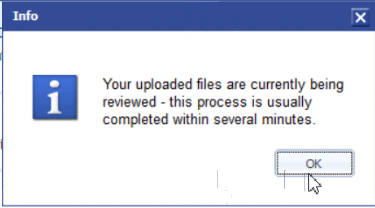 Once uploaded, you’ll get this message: “Your uploaded files are currently being reviewed – this process is usually completed within several minutes.” Dismiss this message by clicking Ok. In the next screen you can see that your copy of ID is now under review. Once this message changes to Verified, you’re good. Close this screen. 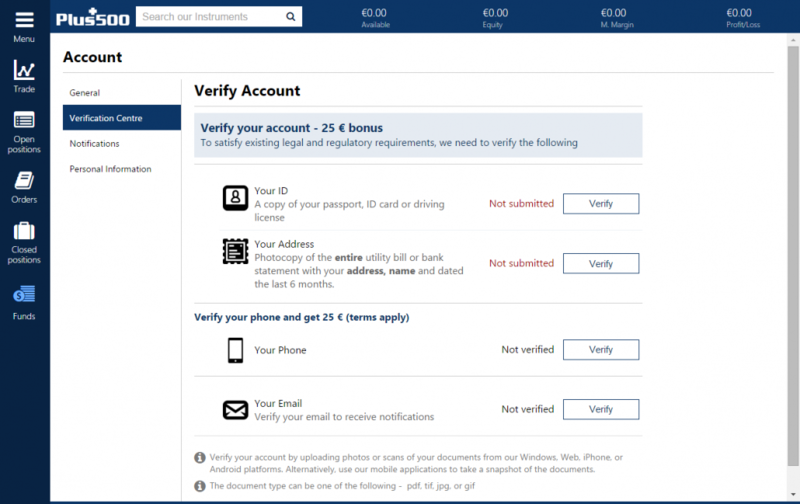 There is also another document that you need to upload to fully verify your account and to be able to start trading. 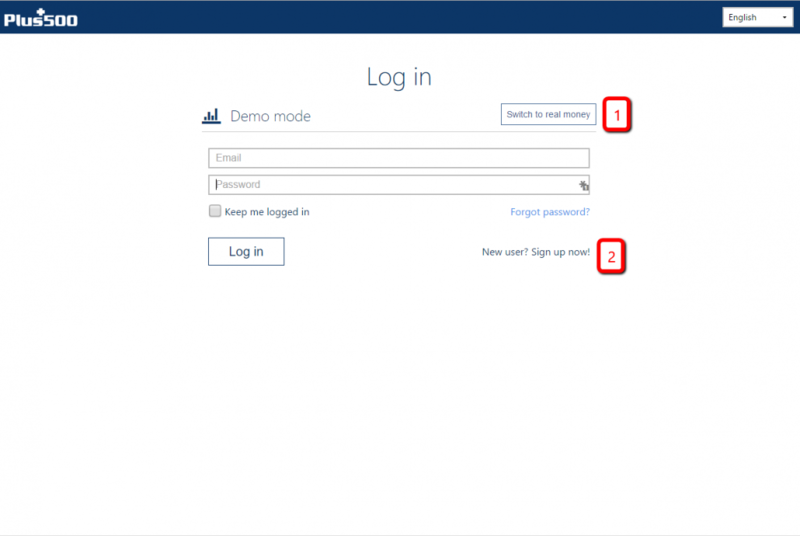 Click on Funds Management again. 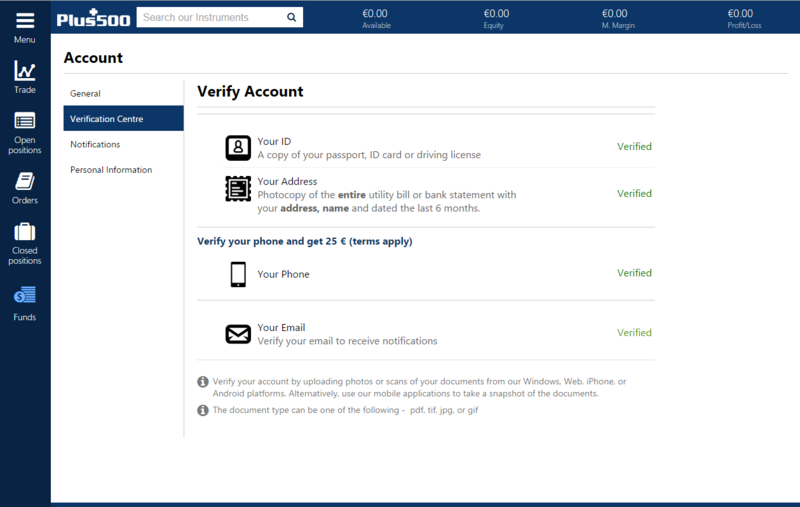 Now click on Verify Account. You’ll see that your ID is already uploaded, what’s missing is a proof of residence. This can be a photocopy of an entire utility bill or bank statement. The only obligation is that your name, address is on it and that the document isn’t older than 6 months. Click on Upload once you have one. Wait for the upload to finish. Your Address section will now also be Under Review. In the next screen you can see my Verified account. I have also verified my email address which is easy to do. You don’t need to verify your phone number. Once you get this one, you’re ready to go! Congratulations! 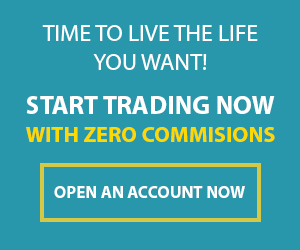 You can now start trading with real money using the software. Transparency is important when it comes to investing your money. When you are depositing your money into an online brokers account that could be scary, because the risk of losing it is present. This article is to show you what our reviewed online brokers do with your money. By making this process transparent, you should find it a lot less scary to invest your money. Is your online broker licensed and regulated? Does your online broker comply with the FCA rules and regulations? Does your online broker have negative balance protection? We have researched Plus500 before opening our own accounts here and to answer the above questions about Plus500. Yes, Plus500 is an online broker that is authorised and regulated by the Cyprus Securities and Exchange Commission (Licence No. 250/14). They are also regulated by the Financial Conduct Authority (FRN 509909). And yes, they also comply with its regulatory requirements. 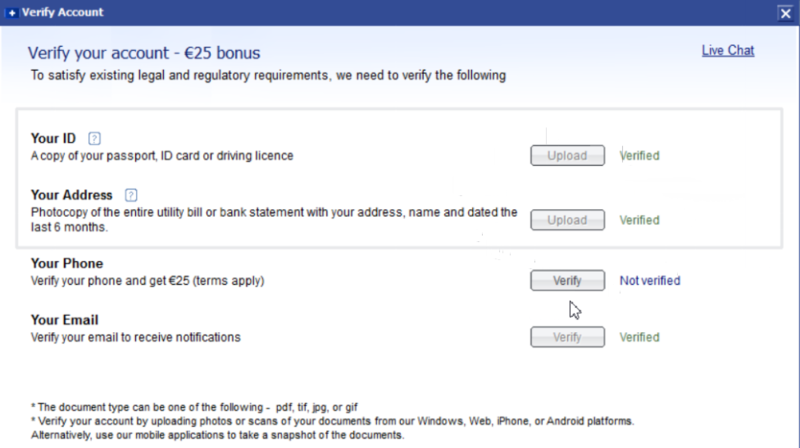 Below I’ll explain what makes it safe to use Plus500. One of the regulatory requirements that is directly connected to us as the users is client money protection. This means that your money is protected, literally. When you open an account with Plus500 your funds will be held in accordance with the Cyprus Securities and Exchange Commission’s client funds rules. Under these rules, Plus500 pays each client’s funds into a segregated client bank account. This means the money you deposit goes into a separate bank account. They do not use your money to do anything for themselves. Furthermore, Plus500 is debt free, has substantial liquidity and significant surplus regulatory capital reserves over its regulatory requirements. This means, because of having more than 1 million clients worldwide that carry out millions of transactions per month, they have enough reserved money to protect yours. Another thing worth mentioning is that you cannot lose more money than you deposited, as Plus500 is one of the few CFD online brokers that offer negative balance protection. This means you do not owe the broker money in case your account has a negative balance (goes below zero). It could happen that a trade moves so fast that the money you used to open the account isn’t enough. With negative balance protection Plus500 automatically closes your position when it goes below zero, which is called margin call. This way you cannot lose more than you deposited. I think this is extremely important to know as there are many online brokers out there that doesn’t have it. Withdrawing money is easy. There are just a couple of steps that need to be done. You have to upload a couple of identification documents first. This is to ensure no money laundering (fraud) and to be sure that the money you deposit goes into the right person’s bank account, so nobody can steal from you if for example by any chance they’ve hacked your account. This means you can only withdraw your deposited money to a bank account using the same name as your identification document. Withdrawing money does not cost anything and usually takes up to 3-5 workdays, which isn’t long at all. My personal experience is that my withdraw shows up within 3 days if I use the wire transfer method. After using one of your favorite forms of payments, it is displayed in your account immediately and you can use it immediately. If you don’t want to use the money you deposited anymore. No problem! You can just withdraw it again anytime, without any additional costs. Please also check out our other tips on how to recognize a good CFD broker. These few reasons is why we have chosen Plus500 as our favorite online broker, because it’s safe and we are not scared of depositing our money in their platform. We trust them. Also, we are already making a small extra income every month by using it. If you have any trouble, please let us know and we will try and contact them for you to solve your problem. Got any other questions? Please feel free to comment below this article. https://www.101trading.co.uk/wp-content/uploads/2015/11/Profits.jpg 338 450 Cassy https://101trading.co.uk/wp-content/uploads/2015/07/logo101trading2.png Cassy2015-11-12 18:28:052015-12-20 15:38:37What does Plus500 do with my money?